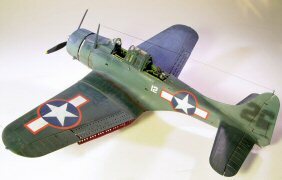 SBD or Scout-Bomber Douglas as it was known in official Navy circles. But to its fearless crews “Slow But Deadly” was not just words. 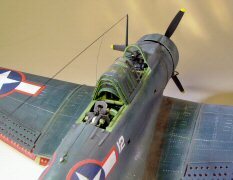 No other aircraft did more to swing the tides of war at America’s lowest point than the vendible little Dauntless dive bomber. When the US was thrown into WWII at Pearl Harbor, the Navy had already realized the SBD was past its prime. 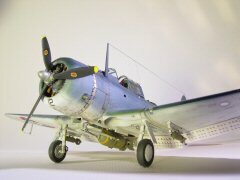 It wasn’t until the SB2C Helldiver replaced it that the Dauntless took on a smaller roll in combat. Its crews loved the predictable handling qualities and its ability to take punishment while pulling incredible g’s at low altitudes. One of the unusual things about this aircraft is it was one of the very few carrier based bombers that did not have folding wings. The one piece wing spar was its secret to such strong wings in the dive bombing roll it accelerated in. 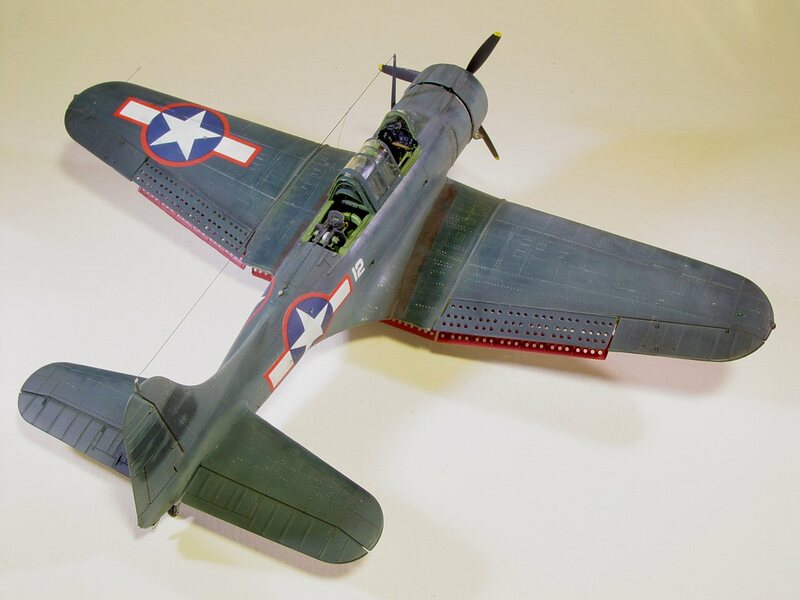 The SBD-5 was produced in the greatest number than any other variant. A total production run of 2,965 of the -5’s were built with the first one being delivered in May of 1943 and replaced older variants like the -3 made so famous during the Battle of Coral Sea and the Battle of Midway. I have always like the booklet style AM gives you and the model paint reference chart are a little bit of heaven. You get FS color conversion along with Model Master, Humbrol, Gunze Sangyo (Aqueous) and Gunze Sangyo (Mr. Color ranger) Polly S and Floquil Classic military colors. What more could you want. The research has already been done for you. After you finish the build, cut out this chart to use on other projects. 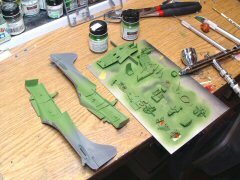 After airbrushing the entire cockpit parts Model Master Acryl Interior Green and detailing them up using my reference material I glued the fuselage halves together with super glue. 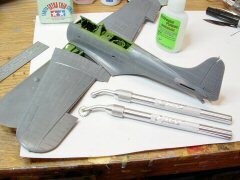 Clamps around the aft part of the fuselage and the engine firewall are the best way to do it. Next item on the list is the floorboard of the cockpit. The tail gunner’s foot pedals are a bit confusing at first but reading the instructions and heeding the drawings will get you through it. 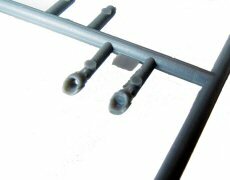 Same goes for the pilot’s rudder control linkage. I ran into another problem with Part # F34. I had to trim a little out of the middle of the two bars to make them fit right in their small cradles in the floorboard. There is a warning about NOT gluing the map table into the instrument panel at this time. The way I think of it is that there is no reason to have it out so I went against the grain and installed it painting the edge a wood color. I had no problems with it. The rest was just straight up assembly and detail that the average builder can handle. Also note that the instrument panel needs to be glued in before the foot rests that goes through the rudder foot pedals. The whole rudder pedals are a bit confusing but once what you understand what AM is trying to illustrate on the directions, it makes sense. Follow the instructions for the rest of the cockpit. Another small deviation was replacing the decal seat belts with some Eduard photo-etched pre-painted ones. The cockpit floor drops solidly into the fuselage and looks great. The fit was good but care must be taken since there is no location pins to help keep everything lined up. I decided that the SBD is one of those aircraft like the Junkers Stuka in that it does not have flush rivets and smooth skin. It was not made for high speed so slick skin was not necessary. Big rivets were needed to hold everything together during dives and high g maneuvers. So I pulled out the trusty old pounce wheel and my reference material and started making rivets. I still consider myself a novice when it comes to this technique. Along with stress skin techniques too. I am still learning and far from perfect with these skills. It did not take too long to rivet up everything and sand down the areas I wanted to emulate the buckled skin of a dive bomber. The lower wings were superglued into place and then the holes were drilled in each wing for the YAGI Radar. Once that was dried, the upper wing skins were glued into place along with the tail planes. The front cowling is a bit awkward. I used superglue on it too and a sanding stick trimmed down to get inside of the gaping oil cooler intake. The top of the gun deck didn’t fit too well and needed a bit of filling and sanding. This area is not real smooth on the real thing but the alignment was still way off. Make sure to align the machine guns up well because they will be sticking out the instrument panel after gluing the gun deck into place. 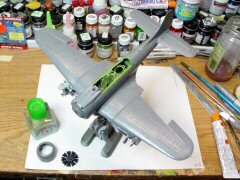 The engine was assembled and detailed out with just some dry brushing. It is fantastic little piece and does not need anything more than a steady hand. Detail to your desire. I didn’t really understand the installation of the oil cooler can too much. I had to trial fit it a few times before I figured it out. It still seemed strange to me. That same awkward feeling came back when gluing the front engine cowl and gun troughs together. Lack of locating pins made it a bit difficult but not impossible. More like a limited run assembly technique. I filled the inside of the bottom of the cowl with Mr. Surfacer and sanded smooth. Then I re-scribed the line down the middle again. It is very viewable from the outside and should be detailed out a bit more than I did. 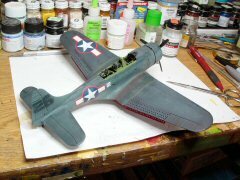 I held off on installing the forward cowling and engine until after painting. I did temp install the cowl just for painting. Once the cockpit got masked off, I hit the entire model with a coat of Model Masters Lacquer Silver. 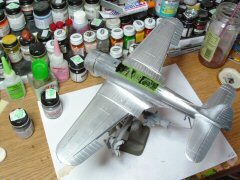 Then the inner wing panels with Model Master’s Zinc Chromate Yellow in anticipation of the heavy weathering that will come later. I also hit the back edge of the flap/speed brake mounting point on the main wing spar. Everything got set off to the side until it was completely dry. Again I held off on the landing gear, bomb racks, bombs and dive brakes/landing flaps until the Tri-color paints were applied. I used the Life Color brand of paint for the dark blue and medium blue and trusty old Tamiya Gloss White for the bottom color. I found the Life Color brand of paints to be a bit finicky. They should be thinned with distilled water only and simple tap water is needed for clean up. Once you get the mixture down right they paint very nicely. You could go with Model Master Acryl and get just as good a result without all the experimenting. Don’t forget the upper speed brakes. 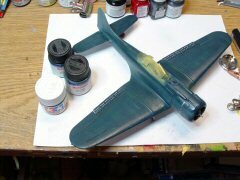 A thin coat of Future got the plane ready for decals. 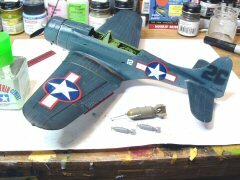 While waiting for the Model Masters Acryl Flat coat to dry, I spent this time, make sure and get all the extraneous parts built and painted like the bomb swing, landing gear, YAGI radar parts, wheel caps, bomb fairing and lower flap/speed brakes and speed brake linkages, etc. The rest of the build is straight forward. Make sure to install the landing gear strut covers (parts # F62L and R) before putting the landing gear struts into place. I did not do this and had to cut the top 1/8 inch off the top of them to fit. I also replaced parts D118 X 2 with small pieces of wire. Hold off putting the small clear window that is on the bottom of the fuselage (J113) until right before you put the bomb and bomb swing into place. AM also gives you the choices of flatten tires or full round ones. I choose the round ones and then flattened them just a bit. There are many different ways you can go with decals. I just couldn’t find anything I really liked except for this one. So I went to the decal dungeon and found the decals I needed to do a plane with VMSB-331 at Majuro Atoll in June of 1944. These planes were often transferred from unit to unit and carried non-standard markings. White 12 was formerly White 26. Evidently some dark blue paint was available at the time and used to paint out the old numbers. It is more than likely that the plane came from TASK FORCE 58 from the USS Essex but that is not confirmed. I tried something new this time with the bombs I glued them together and sanded them down then stippled thinned Tamiya putty on the outside with one of those cheap Testors brushes. This roughed up the surface nicely and then painted it OD green and put the kit supplied decal on the side. I thought all three bombs came out very nicely. More little parts. In typical fashion, the last 20% of the build takes 80% of the total build time. The bomb faring and bomb swing with said bombs attached finished out the business end of this subject. Next comes one of the most distinctive features of this kit, the perforated dive brakes. They were molded very thin and seemed warped across their entire length. The linkage seemed to get in the way and keep the upper dive brakes from setting flush with the wing. I fought with these for a long time. In hindsight I think I would superglue the upper flaps to match the wings better and then custom fit the linkage to that instead of the other way around. It took lots of fiddling around to get all the dive brakes into place. I am still not totally happy with the results. More little parts like the head rest, hanging cable, radar box and dive sight. I didn’t understand the long bar coming out from behind the head rest. A 1/8th of an inch is all you need but this thing was like a half inch long and hit the radar box when installed through the armor plate back rest. I clipped it down to length according to my reference book and it looked great. I liked the .30 cal machine guns. They detailed out nicely with just a little painting and a ring gunsight from Eduard. I posed it in the stowed position. You can do as you wish. For me it was just one less thing I could break off while handling it. For the canopy, I highly recommend a masking set with it. I have always hated doing canopies. They are so easy to mess up. They are a large focal point of the model and a real pain to paint and glue into place. This kit is a little easier than some other kits in this area. You can use either a full enclosed canopy (why would you with that great cockpit detail) or a segmented (opened) canopy set. Again it is your choice. They fit very well when glued into place. The last thing I did was to install all the things that are the easiest stuff to break off during final assembly. The YAGI radar antennas, that giant antenna mast and pitot tube along with the propeller. Oh and the exhaust. I drilled out the exhaust and I think it really helped the look of them. You can use some Moskit stacks if you can find them. Lots have been written about this kit. 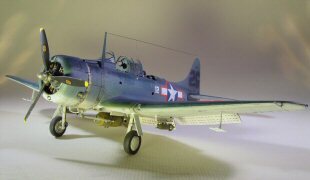 This is my first one of these to build and I can tell you it is the only one to be considered for a true representation of this aircraft. It is almost unbelievable that it has been out for just over 10 years now and is still the standard for this genre of model kits. Here are a few basic observations before we get into building the kit. Don’t bother with an aftermarket cockpit. The engineering here is just amazing. This kit is still considered state of the art even by today’s standards. The perforated dive brakes are amazing but suffer from a noticeable warp and some evidence of undershooting plastic in the molds. Not impossible to fix. The decals are not the best but useable. Your choices are a tri-color with a white #45 or a tri-color with a white #41. Aftermarket decal sheets should expand your choices. The lack of alignment pins is a help and hindrance. Sometimes I really needed them to keep everything together but it also allowed me to line up things very precisely. I was amazed at how thin the trailing edges were. As a matter of fact, that is why I used Superglue to get these edges to stick together. If you were to use a hot glue like Tamiya thin liquid glue, you could melt the edges easily. I really enjoyed this build. It gives you a few little challenges that are well within a moderate skill level. I wish I would have spent a little more time on the dive brakes. The warped planks are distracting to me. I think the upper wing star and bars should have been placed a little more outboard and I have seen proof of two different places the fuselage star and bars should be placed. Use your reference for your specific aircraft. The greenhouse canopy is a bit of a pain but if you are going to tackle one of these planes, you should know what you are getting into already. There are many fantastic qualities of this kit. It can be found for a reasonable price and is worth every penny. 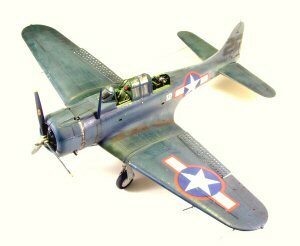 If you want to build a Dauntless of any variant look no further than the Accurate Miniatures boxing of this kit.